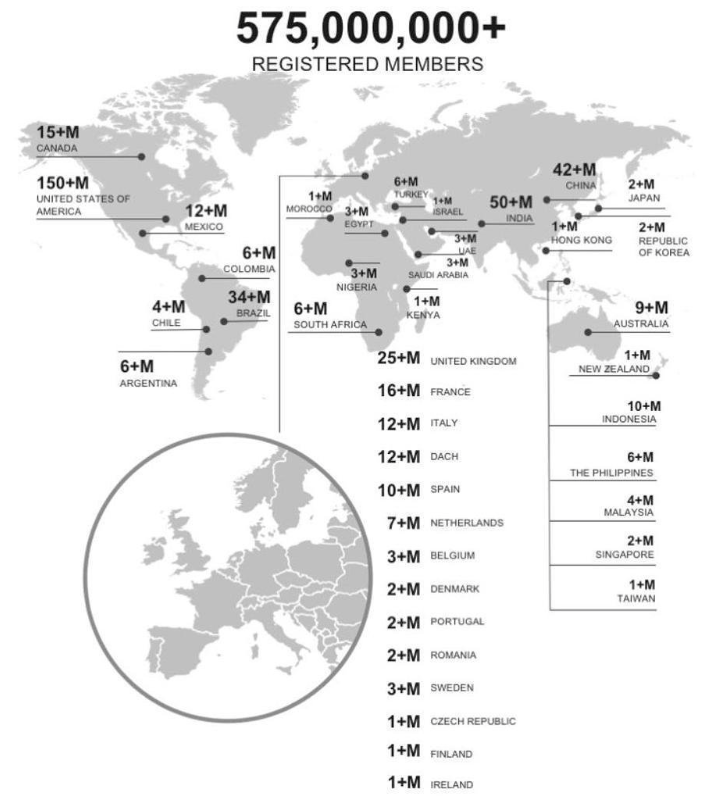 The professional social network, LinkedIn, has reported that it now has more than 575 million members worldwide. LinkedIn has also provided a breakdown of its audience, helping to contextualize exactly where the platform is most popular. As with most platforms, the North American region clearly contributes LinkedIn’s biggest audience share, but interesting to also note the 42 million LI members in China, and 50 million in India, the platform’s second-biggest market. LinkedIn reached the 500 million member milestone last April, which means it’s taken the platform 16 months to add another 75 million new users. For context, Facebook has added around 146 million members in the same period, while Twitter’s added around 9 million – which, on balance, suggests that LinkedIn’s growth is probably above average. But it is important to note the specific metrics being discussed here – ‘members’ and ‘active users’ are not the same thing. Twitter highlighted this recently with its actions to crack down on spam and bot accounts – while Twitter has removed millions of accounts through this new push, the platform still only reported a slight dip in active users in their latest performance report. That’s because most of these accounts aren’t actually active – Twitter’s thought to have more than a billion individual accounts on its network, but it only reported 335 million actives (which would probably also suggest that while Twitter’s action may be improving the accuracy of follower counts, they’re probably not tackling the more problematic, active, re-tweeting bot networks just yet). In LinkedIn’s case, its active user figure is believed to be significantly lower than it’s overall member numbers. While LinkedIn doesn’t officially report this, previous research suggests that LinkedIn had around 250 million MAU when it was on 500 million members, while other analysis has suggested that the platform’s active usage rate is only around 25% of LinkedIn members at any given time. That would put the MAU number at around 144 million currently. Still, it’s a significant milestone, and the company’s growth in high population countries should give it an advantage, helping to boost its unmatched professional database and increase appeal to a wider set of audiences. And worth noting, LinkedIn’s specific database sets it apart from other platforms – while Facebook is trying out its own job listings, it’s not likely to impact on LinkedIn’s core businesses, and the backing of parent company Microsoft should have the app well-positioned for increased expansion in future.